This article will quickly take you through the steps that are involved in repainting a pool. Paint is one of the most popular pool surfaces as it comes in such a wide range of colours and is relatively inexpensive in any of its three forms. 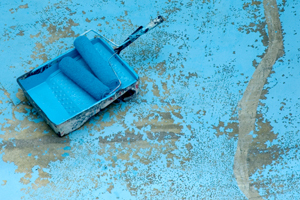 Epoxy paint is the longest lasting of the three finishes but that has a life span of approximately 7 – 10 years, so an in-ground concrete pool is going to need repainting more than once in its lifetime. This article will explain just what that will entail. Epoxy paint is the most long lasting and is the most resistant to UV, pool chemicals and the wear and tear that comes from automatic pool cleaners. Epoxy is the only paint that is suitable for pools that have a marbelite finish. Pool paint with a chlorinated rubber base is not as durable or expensive as epoxy paint but is dependable, easy to use and an inexpensive pool paint. It is easy to apply, comes in many colours and will last about 3 – 5 years. Water based acrylic pool paint can be used on any type of surface. It is easy to apply, and cleans up with water. This type of pool paint is ideal for commercial applications that are repainted on a regular basis. It should last about 2 – 3 years. Painted pools fade over time. Nothing can stop this happening but like all painted finishes a thorough cleaning can brighten them up. A muriatic acid wash will remove any dirt and chalking that is dulling the splendour of your pool but there will come a time when nothing but repainting your pool will do. Any painted surface will begin to degrade over time. The paint may start to blister and bubble. You might even just want to change the colour. Preparing to brush up the finish. As with all painting jobs, the three most important things are preparation, preparation and preparation. To avoid adhesion or blistering problems your pool will have to be repainted with the same type of paint as is already applied so you must determine what type that is. The pool will need to be drained and all the old and loose paint scraped off. Any cracks that appear at this stage will need to be refilled. The next step is to wash the pool down with a muriatic acid solution and then clean it with trisodium phosphate. This will neutralize the acid and remove any grease or glaze that is still lingering. Rinse out your pool, and then rinse it out again. Before you start painting the pool it should be completely dry. You should leave it for about 3 – 5 days in good weather or a little less if it is indoor or under an enclosure. Use masking tape to protect edges, pool lights and other fittings. Start to paint. Obviously you will follow any directions that are supplied with your chosen paint – and they will vary – but you should start at the deep end, if you have one, and work your way up. A second coat can be applied after waiting a few hours and then you will probably have to wait about 5 days before refilling your pool. Once again, the instructions on the tin will give you specific times. As you can see, it’s quite feasible that you could repaint your own pool but having said that the majority of people would rather entrust the task to a professional. We can help you find a pool professional, with the appropriate skills and experience, who is right for you. There is a link at the top of this article that can get that process underway.